Ironically, either too much or not enough home humidity can inflict problems. When there is not enough suspended moisture, a home humidifier may be used. On the other end of the scale, with excessive moisture, a dehumidifier is the answer. Our goal here to maintain a healthy environment, is to ensure a controlled balance. This may be measured by using a humidistat. It is almost a kind of life insurance because controlling humidity will benefit those family members suffering from respiratory conditions. This is because it lowers the growth and propagation of toxic mold and mildew spores. If your house registers too much humidity, there are two possible reasons to start with. Most likely it will be from interior condensation or moisture that is entering from the outside of the house. A simple test to find out which condition it is is to go to a noticeably humid room; the basement is a good choice if your house has one. Tape up a piece of aluminum foil to the exterior wall. Leave it there for a couple of days. Then come back and check it; if the wall-facing of the foil is moist, the moisture is emanating from the outside of your home and may be fixed from the exterior with common methods such as mending your rain gutters or putting in a French drain to keep pooling water drained off. However, if interior condensation is your problem, the indoor-facing side of your foil will be moist. 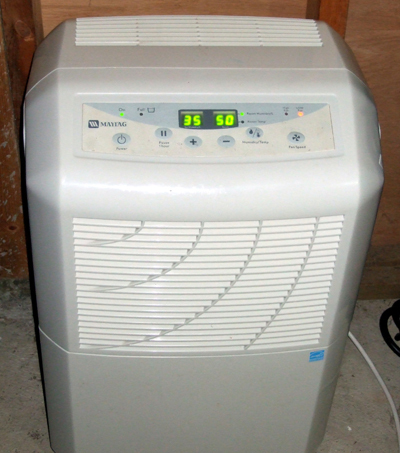 In this case, a dehumidifier is the best way to extract excessive moisture from the home. It is also an excellent method to handle inside environmental conditions associated with water coming from the outside after the methods in the previous section have been instituted. You should note that bathrooms should always be equipped with ceiling-mounted exhaust fans. This will minimize the introduction of more moisture from showering, etc. How? By removing moisture without the cooling effect that A/C units provide. How do they operate? To start with, a small fan pulls in the moist air. Next the combination of compressor, condenser, and evaporator coil work to remove the moisture. This condensed moisture then collects in a drain pan. Depending on your particular situation, the collection pan can be emptied when full (a sensor will turn the unit off automatically), or a hose can be installed to send the water outside or into a convenient drain. In a manner similar to the way that an HVAC system utilizes a thermostat to keep the interior temperature constant, these units use a humidistat. When your saturated air humidity level reaches a level which you have predetermined, it will shut the unit off automatically. When it goes up, the unit turns on again. There are at least two factors you should consider when shopping for your unit; first, the area to be treated in square feet (not cubic feet as would seem more logical). Secondly, how moist the interior air is. Once you have determined those factors, pick a model that is properly rated for your situation. What you want to look at is how many pints of water it will extract in a 24-hour period. As an example, imagine a typical 2000 square foot house. If the air is wet, your unit should be rated at around 32 pints. Less damp conditions? Then 27 pints ought to work well. But if your air is only somewhat damp, downgrade to a 22 pint model. And as with all other modern appliances, always look for the Energy Star label to save money in the long run. You may qualify for an energy tax credit or a cash incentive from your electricity provider.